LOUISVILLE In new cardiac care models, the emergency room is often bypassed as the cardiac catheterization lab becomes the entry and triage point for many acute cardiac patients. The trend has precipitated hospitals to streamline cath lab pathways to minimize door-to-treatment times. Having long been a leader in comprehensive heart care in the region, Jewish Hospital, part of KentuckyOne Health, has once again expanded services and made access for the most critical and high risk patients easier than ever. “Jewish Hospital is the oldest cath lab in Kentucky,” says Naresh Solankhi, MD, interventional cardiologist with KentuckyOne Health Cardiology Associates. “We were the first hospital to do angioplasty in Kentucky.” Now the state’s oldest cath lab has added direct helipad access, an expanded electrophysiology (EP) suite, and new navigation technology to make the most of every minute in cardiac care. On October 1, 2015, Jewish Hospital opened the Jack M. and Janis B. Klempner Family Helipad on top of the Jewish Hospital Patient and Guest Parking Garage. The $2.1 million project was funded by the Jewish Hospital & St. Mary’s Foundation. Prior to October, airlifted patients had to land at University of Louisville (U of L) Hospital and be transported via ambulance to Jewish Hospital. Now the transition is seamless, as a pedway connects the new helipad to an elevator that provides direct access to the cardiac catheterization and EP labs, bypassing the emergency room. Patients can also be transported via elevator to the operating room or the intensive care units (ICU). Timing is imperative for cardiac conditions where mortality is calculated by the minute or hour. “The addition of the helipad is critically important for this subgroup of patients,” says Mark Slaughter, MD, cardiovascular surgeon with U of L Physicians, executive director of Cardiovascular Services for the KentuckyOne Health Louisville market, and chair of the Department of Cardiovascular and Thoracic Surgery at U of L. That group includes patients with acute aortic dissections, acute coronary syndromes, and those in need of extracorporeal membrane oxygenation (ECMO). The helipad is just one recent addition to the enhanced cardiac services for KentuckyOne Health. In July 2015, Jewish Hospital opened its newly expanded EP lab suite, a $1.2 million project funded by the Jewish Hospital & St. Mary’s Foundation. While Jewish Hospital had two existing EP labs, they were in different parts of the cath lab and at full capacity, making it difficult to schedule procedures for five EP physicians. The renovation transformed an existing EP lab and holding area into a three-lab EP suite with a new pre/post procedure area and 20-bay space to allow for more efficient care delivery and programmatic growth. Prior to the expansion, the hospital was doing an average of 90 to 100 EP cases per month. In July, post-renovation, they did 161 EP cases. In the EP labs, electrophysiologists are able to treat electrical problems of the heart with radiofrequency ablations or implanted devices such as defibrillators and pacemakers. One of the EP labs is equipped with Stereotaxis technology, which benefits patients who need ablations for atrial fibrillation, atrial flutter, or supraventricular tachycardia (SVT). “You can navigate all your catheters in the cardiac chambers using a magnetically guided “driver” system, allowing precise positioning. We have the only Stereotaxis-equipped EP lab in Louisville,” says Solankhi. 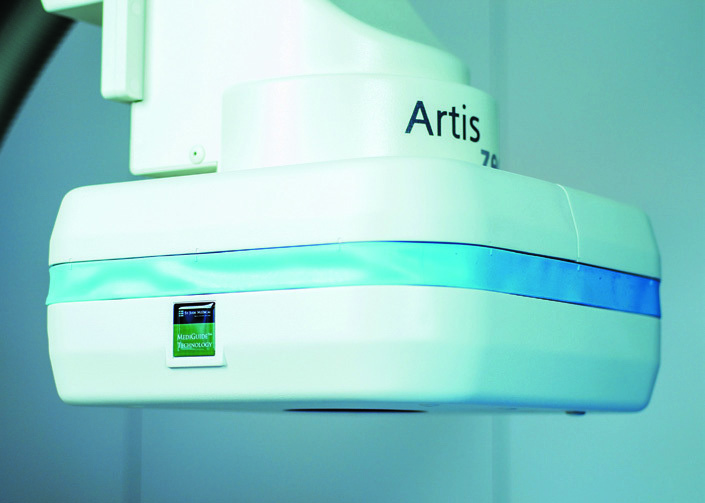 The MediGuide is a four-dimensional, electromagnetic navigation system that limits the need for fluoroscopy during a procedure, thereby substantially reducing overall radiation exposure. “Some of these four- or five-hour cases require a lot of live x-ray, as much as 50 or 60 minutes, so radiation exposure to the patient, physician, nurses, and staff can be substantial,” says Gopinathannair. With MediGuide, the physician takes one three-second x-ray of the patient before inserting catheters into the groin, which the system converts into a background image of the heart. The specialized MediGuide Enabled™ catheters contain tiny sensors that are picked up by the system and allow EP physicians to navigate catheters inside the heart while visible on the pre-recorded image. The system also automatically adjusts for patient movement, breathing, and heart rate. “It allows you to significantly limit the amount of time you need to step on the x-ray pedal. 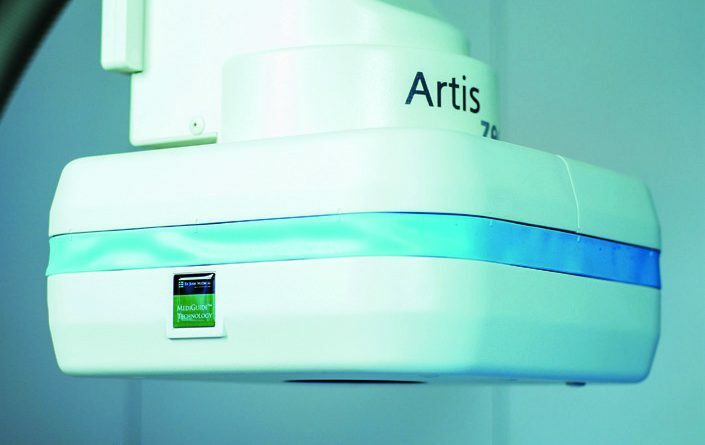 If you look at the data from other centers, many have realized an 80 to 90 percent reduction in their amount of x-ray exposure without compromising the duration of the procedure, safety of the patient, and procedural success,” says Gopinathannair. For example, in a standard ablation procedure for atrial flutter, the procedure takes about an hour with 10 to 12 minutes of fluoroscopy. “With MediGuide what we’ve been able to do is cut that 11 minutes down to 1.2 or 1.3 minutes. The radiation dose has come down from 100 to 200 miligrays to less than three to five miligrays,” says Gopinathannair. Jewish Hospital has done between 15 and 20 cases with the MediGuide so far. Besides ablations, it can be used to place biventricular defibrillators and pacemakers. However, because it is so new, there are limitations as to what tools are available in the MediGuide format, but Gopinathannair expects that to change in the near future. Currently Jewish Hospital is prioritizing cases for MediGuide based on what brings the greatest benefit. One such procedure is the placement of a biventricular defibrillator, which has three leads into the heart and is typically one of the highest radiation exposure procedures in E P. The second is ablations for atrial flutter and SVT. In addition to increased access and expanded EP technology, Jewish Hospital is offering a plethora of new minimally invasive techniques. “In the cath lab, we are doing complex procedures like chronically totally occluded vessels (CTO), procedures for weak heart muscles with a ventricular assist device (VAD) called Impella®, the radial approach, the trans-femoral approach, and angioplasty on patients at high risk for open heart surgery,” says Solankhi. One of the newer techniques for CTO is the Stingray™ Coronary CTO Re-Entry System, which allows physicians to open 100 percent blocked arteries that cannot be bypassed. In research, Jewish Hospital has been participating in the ABSORB Trial, which is studying the efficacy of a bioabsorbable stent that dissolves after nine months. FDA approval is expected this summer. From minimally invasive procedures to open heart surgery, Jewish Hospital also has a new $5 million hybrid operating room (OR)/cath lab for patients that need the best of both worlds. With advanced imaging, cardiology, and cardiac surgery capabilities all in one room, the hybrid OR is being used for transcatheter aortic valve replacement (TAVR); MitraClip®, a percutaneous technique for the repair of mitral valves; and the removal of old pacemaker leads. “We are the first in the state and the busiest program for TAVR, and now we do the procedure with the patient awake,” adds Slaughter. All three physicians foresee advancements continuing to be made as these newer platforms are more fully developed. In the near future, one of the program’s goals is to be identified as a cardiac resuscitation center. “With the helipad and STEMI (ST-segment elevation myocardial infarction) team and anesthesia and cardiac surgery working as a singular collaborative team, the idea is patients in the field that get CPR have a very high mortality, but there is some suggestion if they can get to a dedicated center that has full capabilities such as putting them on ECMO, cooling them, and having artificial lungs and hearts available for acute temporary support, that many of these patients might be able to be saved,” says Slaughter. With all these cardiac tools at their disposal, KentuckyOne Health is certainly on target to improve mortality for these critically ill patients.